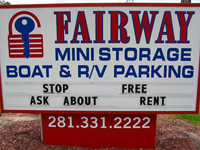 In Alvin Texas it is Fairway Mini Storage, Boat Parking. When you need to store your boat we have exactly what you are looking for. A safe, reliable and secure storage facility to keep your boat safe from the elements. Why Store your Boat Here? When boating season is over and its time to store your boat, you want to know that it’s in good hands. Your boat is probably one of your most valuable possession and you want to protect your investment. Proper storage of your boat is your best option. With most boat owners space is an issue. There is never enough space. This is when boat storage or parking makes sense. Boat storage at Fairway Mini Storage, Boat Parking is paid by the month so it’s an affordable solution for storing your boat this year. Save more money with boat storage at Fairway Mini Storage, Boat Parking! For additional information on boat storage please feel free to contact us. Our experienced staff will be happy to help you find the perfect storage unit to fit your needs. Call Fairway Mini Storage at (281) 331-2222 to reserve your boat storage unit. You may also reserve your boat storage online.